October 29, 2018—Project Angel Heart, a nonprofit organization promoting the power of nutritious food to accelerate healing and improve quality of life for critically ill Coloradans, announced today that Erin Pulling will resign from her position as president and CEO at the end of the year. After nearly 24 years at Project Angel Heart, and 14 years as president & CEO, she leaves to take on a new opportunity to positively impact hunger and nutrition in our community. “We’re grateful for Erin’s many years of leadership at Project Angel Heart and for the tremendous work she has done to elevate the role of food and nutrition in successful disease management,” said Lorez Meinhold, chair of Project Angel Heart’s board of directors. The board of directors will launch an executive search in the near future, with plans to select a candidate who will continue to position Project Angel Heart as a regional leader on the topic of food as medicine. Upon Pulling’s departure in December, Jennifer Lackey, Project Angel Heart’s vice president of development, and Amy Fleming, senior vice president, will lead the organization as co-interim CEOs. 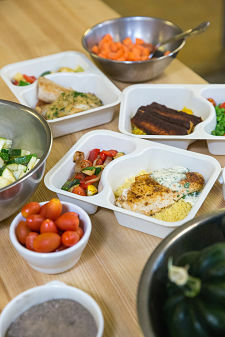 Since 1991, Project Angel Heart has improved the health and well-being of Coloradans living with serious illnesses by preparing and delivering medically tailored meals. The organization provides meals to more than 3,000 Coloradans annually and partners with local health care providers to improve their patients’ health and quality of life.